Benjamin Franklin was born in 1706 into a family of very modest means. Today, they’d probably be called lower middle class at best. His parents had just enough money to send him to school for a couple of years in hope that he could eventually join the clergy, but by the age of 10, he was done with school. He was a print shop apprentice by the age of 12, climbing around on printing presses, sorting letters, mixing ink, and all of the other tasks needed to keep a printing press running. From that humble background, Franklin became a highly successful printer, a well known writer, a scientist, a politician, and a diplomat, among the many other hats he wore. During those efforts, he accumulated enough wealth to effectively retire independently wealthy in his forties, and he largely devoted the rest of his life to public service (and his individual interests). He was such a towering figure in the American Revolution that he was deservedly called the “first American,” and his light shines brightly even today. Even to this day, Franklin’s Autobiography is a splendid read. You can get a nice pocket edition of it for just a few dollars, check it out at your library for free, or download it and read it electronically for free. No matter how you read it, I highly recommend you do so, as it’s an insightful book about an amazing person. One of the things that has really stood out to me each time I’ve read his autobiography is the fact that he attributed most of his success (beyond that of luck) to practicing 13 core life virtues, to the best of his ability. He believed that by living those virtues, he had done everything he could to put himself in a position to be on the good side of the unexpected events of life. He actually had an incredible system for working on those virtues, which I want to talk about today. For a large portion of Franklin’s life, he carried around a card in his pocket that depicted a simple table with seven columns and 13 rows on it. Each column on this card represented a day of the week – Monday through Sunday. Each row on this card represented one of 13 virtues that he wanted to work on. During the day, he might glance at these virtues a time or two to keep them fresh in his mind. At the end of each day, however, he’d pull out a pen and go through those virtues, asking himself if he’d actually practiced them during the day and marking the box if he had done so. His goal was to fill in as many boxes as possible, and each week, he would start anew with a fresh blank chart. That wasn’t all. Not all of the charts were identical. In fact, he had 13 variations of the charts, which he cycled through every 13 weeks. On the top of each variation of the card was listed one virtue, which was the main one he wanted to practice that week, along with a brief description of that virtue. For example, one week, he might really focus on frugality, while the next week might particularly focus on temperance. He’d reflect on and record his success with all 13 virtues each day, but he would intentionally focus on just one virtue each week. You can download a generic duplicate of his virtue card (without the specific focus for the week) here. A final key part of his practice is that he’d review the cards as a whole at the end of each week, evaluating which virtues were successful that week, which ones were not, and which areas really needed focus and improvement in his life. He’d also review them as a set, and thus with 13 cards to review, that roughly covers three months of living. A larger review like this – a “quarterly review” if you will – can point you to some larger patterns along your path to becoming a better person. Over time, these virtues became more and more ingrained in his character. He found himself naturally practicing them more than he once did, which made him into a more well-rounded and successful person and a better participant in society, which he attributed to being a healthy part of the success that he found in almost every attribute of life. So what were these 13 virtues? Here are the virtues that Franklin tracked and reflected upon each day. His goal was to improve himself with regard to each virtue so that over time he was a better person in that regard, and by being a better overall person, he was more open to life’s opportunities. Eat not to dullness; drink not to elevation. This one’s pretty simple. Eat until you’re not hungry any more rather than stuffing yourself, don’t eat just for entertainment’s sake or for boredom’s sake, and stop drinking when it begins to impair your judgment and sensibilities. It’s about self-regulating what you put into your body and making the conscious choice to put in only enough for good living. If you don’t have anything of value to add to a conversation, don’t do so. Instead, just listen to what’s being said – and actually listen. Try to seek out meaningful conversations and avoid meaningless chatter. This doesn’t mean that you avoid getting to know other people and small talk, but that you recognize that there is a distinct purpose to such conversations and you keep a focus on that purpose. Idle chatter for no purpose is the problem, as is speaking just to fill space in the conversation. Keep your physical possessions organized so that you can always find what you need. Do the same with your time, so that you always have time for the things that are important to you; if that’s a struggle, adopt some form of time management or a smarter approach to one’s possessions. If you have too many things that it becomes very difficult to keep them all straight, then this is a call to start downsizing the less important things. If you decide to do something, carry through with it. Don’t commit to things that you can’t follow through on or aren’t actually intending to follow through on. Say “no” if you’re asked to do something that you can’t actually follow through on. In fact, if you’re unsure, say “no” just so you’re not left with someone else holding the bag due to your failure of resolution. If you say “yes,” follow through on that yes. Make no expense but to do good to others or yourself; i.e., waste nothing. My favorite virtue, perhaps. Don’t be wasteful with your money. Whenever you spend a dollar or use something, have it be genuinely purposeful. You want to get maximum value for the dollars that you have when you choose to spend them. If you’re not choosing to spend them, put them to work for you in some aspect of your life, either by paying down debt or building an emergency fund or saving for a big goal like retirement. Lose no time; be always employ’d in something useful; cut off all unnecessary actions. Don’t spend your time idling. Try to spend your time doing something productive, and if you lack the energy or focus to do the task at hand, find something else that fits where you’re at. If you don’t have anything on hand to do, spend that time improving yourself. If you’re too tired to do anything, sleep, and if that tiredness is consistent, engage in purposeful leisure or talk to a doctor. Be honest in your words, but also kind in terms of the impact that they can have on others. Don’t be hurtful with what you say, but strive to lift up the other person. Don’t lie and don’t mislead, but don’t be cruel with your words, either. If you must criticize, find ways to criticize without being “brutally honest,” which is insincere in its intention. Don’t bring harm to others for your own benefit. Try to find ways so that everyone involved in your interactions finds some genuine benefit. Seek out solutions so that everyone wins. If you agreed to an arrangement, stick by that arrangement, or renegotiate it if it’s now untenable. Avoid extremes; forbear resenting injuries so much as you think they deserve. Choosing extreme positions or acting toward others in extreme ways often ends up with negative consequences for you without any real benefit. Avoid taking positions or behaving in ways that bring harm towards others unless you intentionally are bringing harm, in which case be careful in the amount of harm you bring. Tolerate no uncleanliness in body, cloaths, or habitation. Practice hygiene. Keep your clothes clean. Keep your home clean. Keep your office clean. Keep your teeth clean. This is not only for your own health, but also for how you present yourself to the world. Don’t be upset by the unexpected events that life throws at you. They’re going to happen – being upset does not help resolve them. If you recognize your emotions swelling, consciously keep them in check. Learn how to recognize your own emotions inside and understand them without reacting to them or acting upon them. Use them as information instead in order to make better decisions. Rarely use venery but for health or offspring, never to dullness, weakness, or the injury of your own or another’s peace or reputation. Don’t let physical passions become a distraction or a main focus in your life. Don’t allow it to cause you to betray or harm others. Again, if you find yourself in a position where things are untenable, seek outside help and don’t simply toss the virtue to the side. Undersell and overdeliver in everything that you do. Don’t talk about how great you are; instead, be great and give abundant credit to others. A person who is a true master of these 13 virtues would be a great person, indeed, and would likely find that great success nearly falls on their lap. While I believe that these are all worthwhile virtues to practice, one might want to choose other virtues – or even personal skills – that they want to improve and substitute them into Franklin’s plan. One could easily remove some virtues and substitute other ones, or even start from scratch with one’s own virtues. For example, let’s say that someone wanted to use this practice to strictly improve their finances. They would likely retain frugality and temperance, but they might want to add other virtues and skills to the mix, such as mastering food preparation, using deliberate practice in one’s career path, building social skills, and so on. Let’s say that you wanted to master becoming a calmer person. You might include things like meditation, stoicism, and prayer in your list of virtues. It all depends on what you want to achieve. However, I will say that Franklin’s list of 13 virtues really will go a long way toward improving your overall character and life situation no matter where you’re at in life. The goal with all of this is to come up with a set of very specific virtues or skills that you can apply every single day to become a better person, the person you want to be, and then review your progress with those virtues and skills each day. Over time, those skills and virtues would become natural to you, shaping you into the person you desire to become. The key to this, of course, is to make it a daily practice. 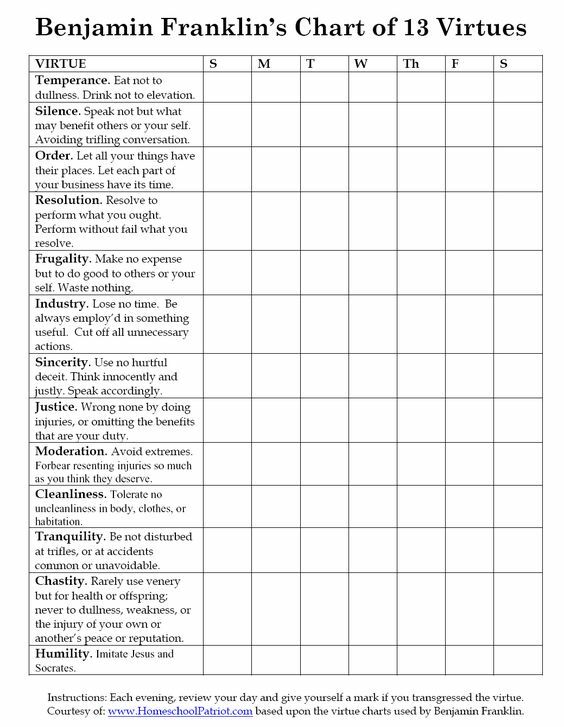 Once you’ve defined a set of virtues or specific skills that you want to work on in your life and integrate into your normal behaviors, take it a step further and copy Franklin’s entire system, using your desired virtues and skills as the basis for your practice. You can start by making a set of cards for the virtues you want to practice. It’s pretty simple to design a small table, with rows for each thing you want to improve and columns for each day of the week, in your preferred word processing program. Just design a size that prints easily on a blank 4″ by 6″ index card and print them yourself. If you prefer, you can also design them by hand using a ruler and a pen. On each card, simply write the days of the week at the top of each column and an abbreviation of the skill or virtue you want to practice to the left of each row. Consider designing a set of these cards, one with each virtue or skill you want to practice at the top with a brief description, so that you have a particular virtue or skill to focus on that week. Print off (or make) the entire set at once, cycle through all of them, and then make a new set and start from scratch. You can also implement this practice electronically. Just use a note program on your smartphone that contains a list of the virtues that you can use to review each morning and each night. A simple program like Evernote can handle the job quite well. At the end of the week, review your overall progress. Which virtues are you particularly weak on right now? What can you do to strengthen those virtues going forward? Use the data you recorded – both the marked virtues and skills you succeeded with and the ones you missed – as a source of insight on how to continue to improve. The key thing to always remember with a process like this is that it takes time. People always want immediate results that appear like magic. Improving yourself takes time, and then it takes even more time for the effects of that improvement to propagate out into your life. The key thing with this is to remember that you are getting better, little by little. If you strive to be a little better than the day before, you’re always heading in the right direction, and given enough time, that change will ripple out into the world. This really is a simple yet brilliant system for genuine self-improvement. It can help you change your character as a whole or help you bring about true lasting improvement in specific areas of your life. The key is to trust the process – keep doing this over a long period of time and you’ll find yourself in a better place.